NFC tags and QR codes have risen in popularity in the last couple of years and are excellent channels to deliver proximity marketing campaigns without an app. NFC-enabled products have made quite a splash this year and give businesses a way to create an interactive experience in-store and post-purchase. From bringing games to life to allowing users to unlock offers through NFC tags on clothes, NFC has become the bane of proximity marketing without an app. Most Android phones support NFC but Apple’s latest iPhones have also added support for NFC tags without needing an additional app. The older versions also support NFC with an app. NFC technology is about to explode in the next 5 years and by 2025, it is going to be worth $50 billion. QR codes, on the other hand, have become so popular in China and India with apps like WeChat and Paytm respectively. 4% of the entire transactions in the world happened through QR codes. Apple’s renewed support for QR codes may be the reason for this increasing popularity. In the latest iOS 11 update, Apple made it possible for iPhones users to scan QR codes through the camera app. Since iPhones don’t need an additional app, marketers have flocked to QR codes to run proximity marketing campaigns. With QR codes, businesses can offer deals, discounts, scan and go functionality, relevant product information, redirect them to social media and ask them to leave reviews. Beaconstac’s dashboard has a clever feature associated with every marketing campaign – a QR code. Businesses can easily download and print that QR code out onto a visually appealing poster accompanied by an equally compelling copy outside their store to entice new customers. On iOS devices running iOS 11 and above, the QR code scanner is an inbuilt feature and does not require an app to run this kind of proximity marketing campaign. Most Android devices also have this native functionality and do not require an app. This does not require the Bluetooth to be enabled on the smartphone. Beaconstac’s seamless dashboard also makes it possible to retarget these new customers without an app. All that is required is the Facebook Pixel ID or the Google Conversion ID and you’re good to go. 3 out of 4 customers notice retargeted ads. Retargeting also instils familiarity leading customers to trust your business over others. Out of home advertising has always been a significant channel for businesses and marketers to reach out to potential customers. A digital, dynamic billboard that you can fine-tune in real time allows you to reach a mass audience effectively. You can also choose to run an ad asking them to either scan a QR code or tap on an NFC tag to avail offers, book an appointment or download an app. 81% of Americans use coupons on a daily basis. Adding a copy that effectively conveys to customers the benefits, deals and discounts they can unlock is instrumental in getting this large audience to become part of a hyperlocal contextual experience. Businesses can also use the NearBee SDK in a radical manner by integrating it into a shopping app that is already widely adopted by the local consumers. Doing so helps the entire neighbourhood of retailers who can now target new and loyal customers. Customers can begin to receive relevant contextual information. Beacons can exponentially improve a customer’s in-store experience. Proximity marketing through beacons is a market that is on the rise. It is predicted to be worth more than 52 billion USD by 2025. It is also interesting to note that while Google may have pulled the plug on Nearby, they are continuing to send Google beacons to small businesses. While the idea, in theory, was that Nearby allowed proximity marketing campaigns without an app but, in reality, it resulted in very poor user experience. With NearBee, we will have anti-spam algorithms in place to discourage the app from being misused. Not to mention, we also intend to introduce a ‘follow’ feature on NearBee that will allow customers to follow businesses and receive updates even when they are no longer in the range of the beacon. It is also crucial to think out of the box and put beacons to use in more unconventional ways than just offering deals and discounts. Cross-channel promotion, offering product information like its availability and features, enhancing digital signage and augmenting salesperson all chip in when it comes to improves a customer’s in-store experience and a business’s relationship with their customer. Proximity marketing without an app in 2019 is a very real possibility with NFC and QR codes. There isn’t a binary solution to proximity marketing but rather a connected solution involving all 3 technologies is the answer to increasing a business’s ROI. Read how BLE beacons, QR codes and NFC can be used to boost millennial engagement. 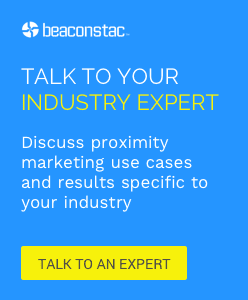 Join forces with Beaconstac to stay ahead of the curve in the proximity marketing market. Talk to our beacon expert who can help you get started today.